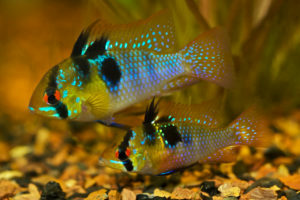 The much sought after Blue Ram (Mikrogeophagus ramirezi) is one of the true gems of the cichlid family. It has all the beauty and character of the bigger South American cichlids, without the drawbacks like aggression, the need for a large territory and digging habits. 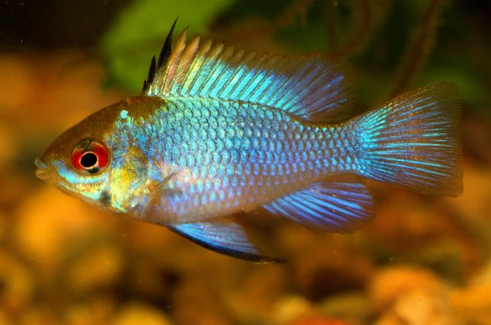 The Blue Ram is a small colourful fish with an oval shaped body and pointed fins and tail. Mature males develop more pointed dorsal fins than females and also grow larger at about 2 inches (5 cm) in length. The body has a yellow area on the first third of the body starting at the nose, with the last two thirds being whitish blue to a speccy blue. There is a curved black line that runs vertically from the forehead, through the eye, and then down to the chin. There is a black spot in the middle of the body. The fins are a clear yellow colour and can have a black blotch on the first few rays of the dorsal fin. The female has similar colouring, but also has a pinkish orange belly. 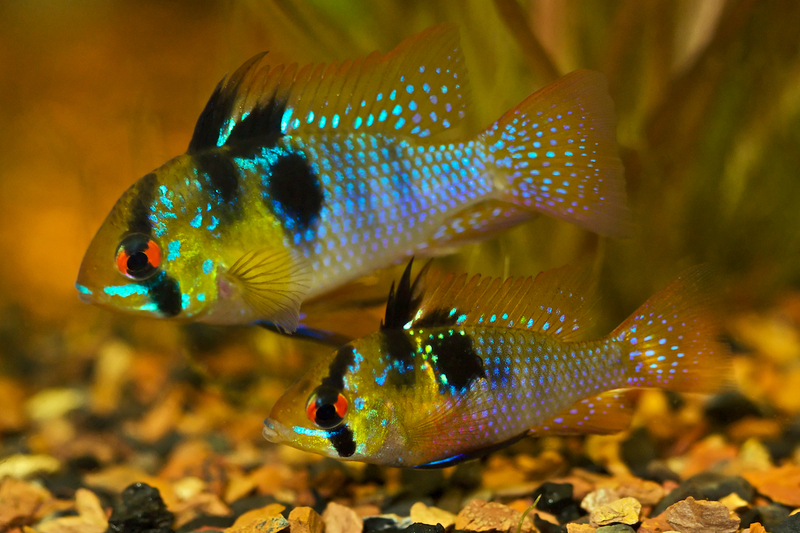 Sexing Blue Ram Cichlids is tricky yet achievable. Firstly, adult males grow larger than females, and possess a slightly more extended dorsal fin, forming a crest. Most females possess a pinkish patch on the belly which is absent in males, and will also have one or many iridescent scales scattered on the dark spots below the dorsal, whereas the males spots will be solid black. To give every chance for mature Blue Rams (mature after around 9-10 months) to breed, feed the fish a high protein diet (perhaps twice a day with one of those feeds being a frozen bloodworm or brine shrimp) for probably two weeks or so.